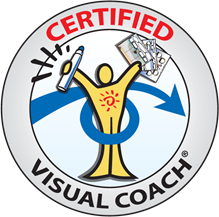 For 6 years now, via my Visual Coach Certification, I’ve been mentoring other Process Professionals who work with individuals in how to work visually with their own clientele. Mostly coaches … however therapists, counselors, financial advisors, disability specialists and bodyworkers have also participated. It’s a fascinating learning and experiential curve they go through to integrate these skills into their own practices. And, as our current cohort is about mid-way through their program, I thought it might be interesting to share some thoughts about this acclimatization journey. Most of our Visual-Coaches-in Training are already seasoned professionals in their own right, having been in practice for years. However occasionally I admit a newer coach or someone who is concurrently taking coach training parallel to my program (my favorite recommendation for foundational coach training is Coaches Training Institute, my alma mater). These new coaches not only receive mentorship in Visual Coaching, they also (through their seasoned cohort mates and I) receive guidance on the following basics that all coaches need to learn client attraction, contracting, proper professional boundaries and mitigating common pitfalls (not working with family or close friends, client screening, scheduling and financial policies, time management and the necessity of good self-care). 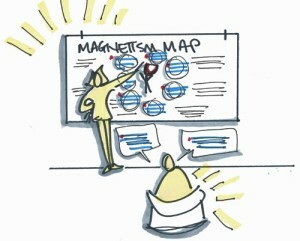 I began integrating visuals with coaching back in 2000, during my initial CTI training. 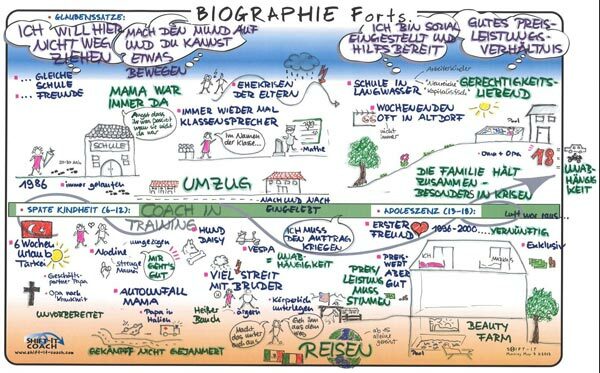 In my regular day job I was a Graphic Recorder (travelling the world as a visual scribe for high end business meetings), so I couldn’t help but doodle when I began working with individuals. During CTI classes, I had a lineup of people who wanted to work with me during exercises, because of the engaging visual notes that I took. I realized then and there this was an effective way to work and I’ve been doing it ever since. Back then, when I began my coaching practice, I worked with my clients the same way I did my meeting work – in-person with large sheets of mural paper taped to the wall and my markers and pastels. I literally drew their thinking out of them, right onto the wall in front of their eyes (highly interactive – the client sees the displays as they are being generated). And then I photographed the charts to create small digital reproductions that my client could more easily take with them (although often they wanted the large size original murals too!). Over the years, as my own practice evolved, and as technology evolved too, the options for how to work with clients grew. Most coaching, at least when I started (and it’s still true today) is done over the phone. So I created small visual printouts (templates) to work with my phone clients (Merkley Maps and The SHIFT-IT Visual Coaching System®). 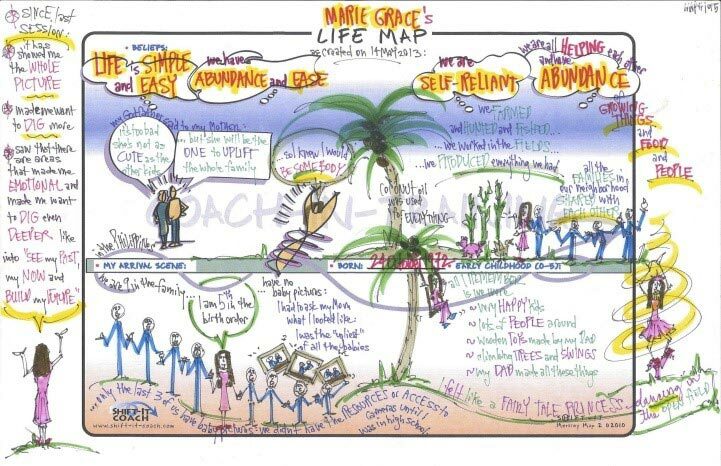 Our coaching sessions were conducted by phone and I would visually scribe onto the SHIFT-IT maps at my end, scan and pdf them, then email to the client. This method does not have live visual interaction with the client but it works. I did it for years and some of my coaches still do. In the last few years a big evolution has occurred in my Visual Coaching work … the use of digital tablet with web conferencing. This approach really busts Visual Coaching wide open in such EXCITING ways! Now we can harness the power of interactive-visuals across vast geographical distances. No more having to be in the same location in order for the client to see things spontaneously emerge in front of their eyes. Although I still love to work with paper on the walls with clients when I can! Sooooooo, each Visual-Coach-in-Training has decisions to make about which delivery method they want to work in. As they progress through the training, they often try out the various ways (in-person, phone-with-templates and tablet-with-web-conferencing) to see which they prefer. I’m happy to report (even though it can involve additional investment in equipment and skills) that more coaches are jumping immediately into the tablet-and-web-conferencing method with great results. It’s necessary to spend upfront time verbally explaining Visual Coaching in general and the specifics of my SHIFT-IT System (the first half of Visual Coach Certification is 10 training webinars). However, the greatest learning, in my opinion, comes when the coaches roll up their sleeves and begin in earnest to work visually with their clients. 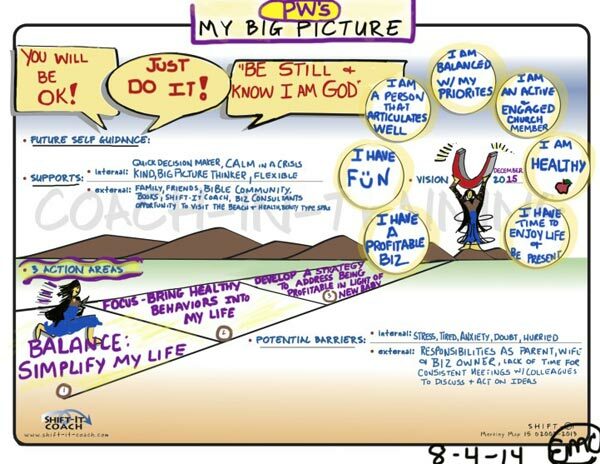 In my program the coaches have to find their own clients and do 24 hours of documented Visual Coaching work with them. I do have a list of volunteers from my community for the newer coaches who don’t have a fully functioning practice yet. But I prefer not to make those matches right away, because to do so deprives the coach of good learning and skill development. It’s good for them to learn how to go out and find their own clients. The analogy of a chick breaking out of its egg comes to mind. You actually endanger the chick if you break open the shell for them. Through the process of breaking the egg on their own they develop needed muscles and stamina. 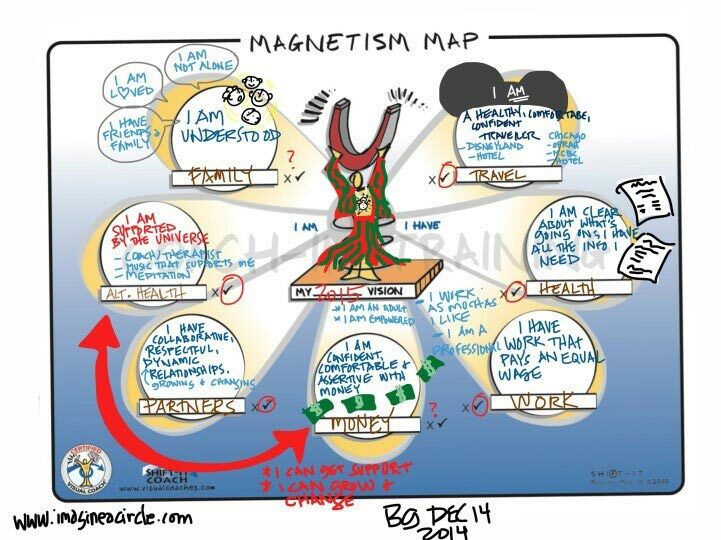 To tie this to process work, if you want to be a successful practitioner, visual or otherwise, you need to develop your entrepreneurial muscles and figure out client approaches that work for you and your personality. I ADORE the experiential stage of my program and the massive growth that occurs. Often, even seasoned coaches, are vulnerable when they begin to work visually with their clients. Depending on their chosen delivery method (as some are more complicated than others) there is a sweet learning curve that all Visual Coaches must go through. They just can’t skip the steps. The nurturer in me wishes at times that I could wave my magic wand and help them bypass the vulnerable, awkward, clumsy stages that one goes through when they first learn a new craft. But I can’t. All of us have to weather that phase. And that is as it should be. I love the transformation that happens over the course of this program. People enter as one kind of person and leave another by the time they have completed all the requirements. Some trainees come to me loaded up with artistic skills already. Most don’t. As I reiterate in my trainings and writing over and over again, working visually with your process clients isn’t about ‘art’ per se. It’s about supporting people to SEE what is going on for them. And that seeing doesn’t have to be pretty or perfect. Functional and useful is what it’s all about! 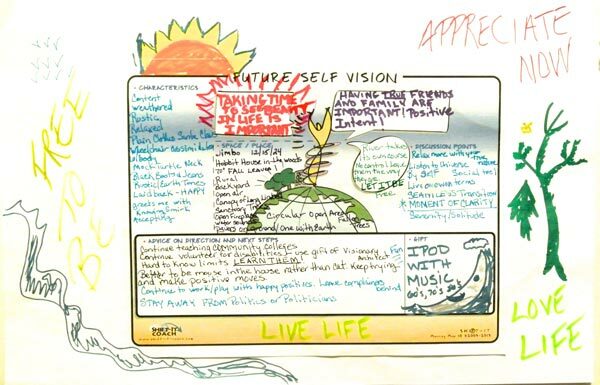 The artistic level of the live interactive Visual Coaching work can be quite basic (color, shapes, doodles and pre-drawn templates). As live process workers we don’t have time to overly fuss otherwise we lose rapport with our client. So it’s a matter of getting unconsciously competent with the basic visual skills, though practice, so you work quickly and rapidly in the moment. If something needs to be more polished, you can do that in your studio afterwards. 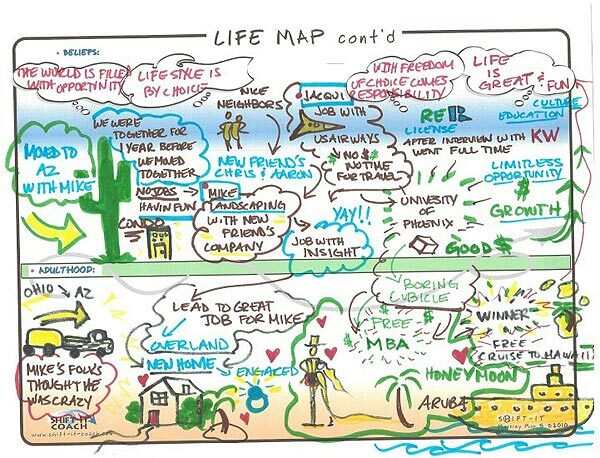 Clients really appreciate having their own words and thoughts drawn right out of them on the fly. They are very forgiving of lapses in drawing ability (if they weren’t, I wouldn’t be writing to you now, as my drawing abilities are far from perfect). 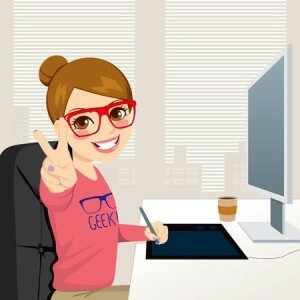 Good, strong process skills are key … that is the backbone upon which the visual skills are built. 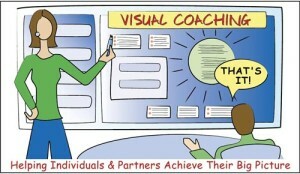 Not only do I teach my Visual Coach students how to work visually, I also teach them the power of a good coaching alliance and how to build their practices. My SHIFT-IT System®, which they learn as part of the certification program, is a solid one. One that often deeply bonds a client to their coach given the work is so intimate and powerful. Doing good work begets more work. 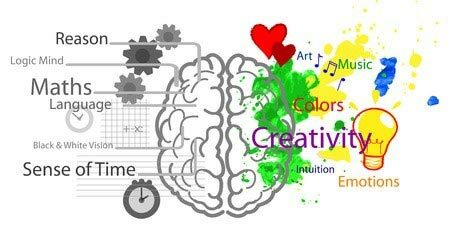 As does having a solid left AND right brain to more fully serve clients. Not only does a good coach know her/his craft, she/he must also know business and structure their practice accordingly. 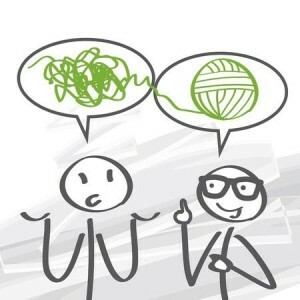 Good coaching, as with any good process work with individuals, works best when a whole brain approach is taken! Many clients want to continue their coaching alliance and engage our coaches for further implementation and follow up work after their initial engagements. That kind of ongoing alliance is critical for building a robust and sustaining practice. At the end of Visual Coach Certification, each coach goes through a final exam process. Part of this examination process includes live Visual Coaching with a client, using one of the SHIFT-IT maps (I determine which one based off of what I feel will best serve the client as well as what proficiency I want the coach to demonstrate to me). The work between the coach and client is done in private however it is either video or audio recorded (so I can review it afterwards and give my analysis). I like to the opportunity to be a test client to my community (usually readers of my eZine). As it’s a great way to get some good quality coaching and also check out this method if you are curious about it. If you would like to be a Test Client, just email my assistant Patricia at admin@shift-it-coach.com to be added to our Test Client List. And we’ll shoot out an email when the next Test Client opportunity presents itself. Need coaching? Looking for qualified, effective support to shift your life?! We have great coaches sprinkled throughout the globe with many different specialties. See Visual Coach Directory to find your coach. If you need help in your selection, write us and we’ll help you! 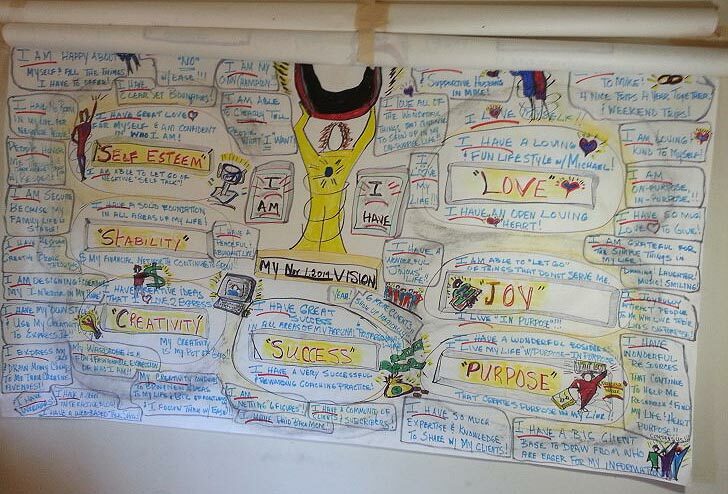 I run one Visual Coach cohort annually, beginning in April and concluding at the end of the year. For more information, click here. There are two pre-requisites for this program: SHIFT-IT and Fundamentals of Working Visually (or equivalent experience). Plus, you need to have some prior experience that ethically enables you to work with individuals (as I’m not teaching you how to coach per se, I’m teaching you how to add visual skills and my tools to the process work with individuals that you already do or want to be doing).